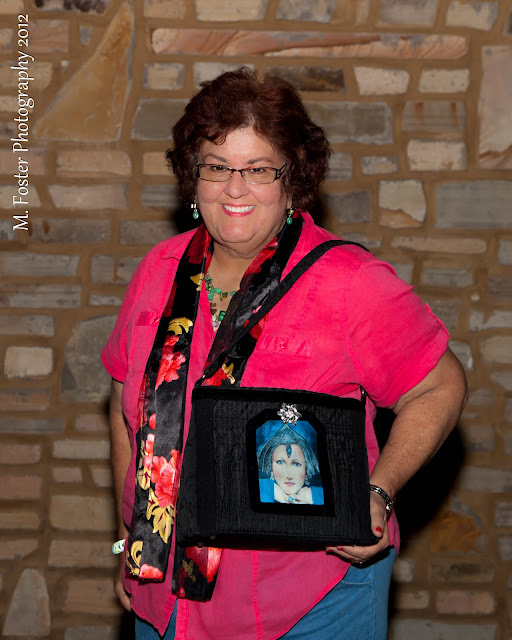 FabricLovers Blog: Great Photo of our Purse Winner! Great Photo of our Purse Winner! My name is Susan, and I was one of the people who commented on her beautiful one of a kind purses. Well, I WON !!!!! As you can see in the picture, I was so happy when I was notified. It is even more beautiful in person than online. I would highly suggest anyone who would like to own an awesome one of a kind purse/bag to contact Tracey Marcrum who is a very talented artist. She has been around the world, comes from a family of artists, and knows her stuff. Thank you Tracey, and Thank You Fabric Lovers for the interview with Tracey. What a beautiful prize, and you do indeed look happy Susan! Thanks again to Tracey Marcrum for making the give-away possible. Be sure to check out all of her one-of-a-kind purses on her website here.